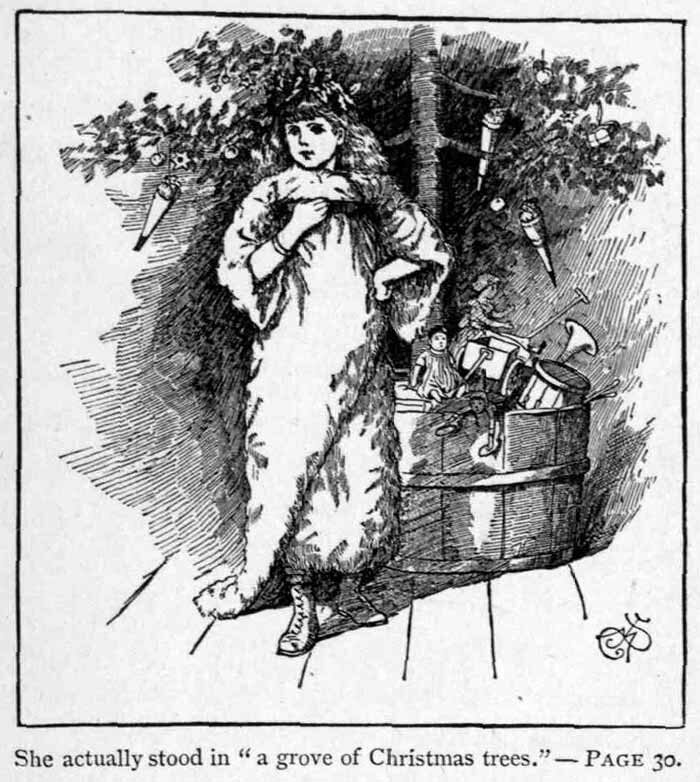 Characterized as "Dickens' A Christmas Carol for children." This short story appeared in The Louisa May Alcott Reader: A Supplementary Reader for the Fourth Year of School in 1908. "I'm so tired of Christmas I wish there never would be another one!" exclaimed a discontented-looking little girl, as she sat idly watching her mother arrange a pile of gifts two days before they were to be given. "Why, Effie, what a dreadful thing to say! You are as bad as old Scrooge; and I'm afraid something will happen to you, as it did to him, if you don't care for dear Christmas," answered mamma, almost dropping the silver horn she was filling with delicious candies. "Who was Scrooge? What happened to him?" asked Effie, with a glimmer of interest in her listless face, as she picked out the sourest lemon-drop she could find; for nothing sweet suited her just then. "He was one of Dickens's best people, and you can read the charming story some day. He hated Christmas until a strange dream showed him how dear and beautiful it was, and made a better man of him." "I shall read it; for I like dreams, and have a great many curious ones myself. But they don't keep me from being tired of Christmas," said Effie, poking discontentedly among the sweeties for something worth eating. "Why are you tired of what should be the happiest time of all the year?" asked mamma, anxiously. "Perhaps I shouldn't be if I had something new. But it is always the same, and there isn't any more surprise about it. I always find heaps of goodies in my stocking. Don't like some of them, and soon get tired of those I do like. We always have a great dinner, and I eat too much, and feel ill next day. Then there is a Christmas tree somewhere, with a doll on top, or a stupid old Santa Claus, and children dancing and screaming over bonbons and toys that break, and shiny things that are of no use. Really, mamma, I've had so many Christmases all alike that I don't think I can bear another one." And Effie laid herself flat on the sofa, as if the mere idea was too much for her. Her mother laughed at her despair, but was sorry to see her little girl so discontented, when she had everything to make her happy, and had known but ten Christmas days. "Suppose we don't give you any presents at all,--how would that suit you?" asked mamma, anxious to please her spoiled child. "I should like one large and splendid one, and one dear little one, to remember some very nice person by," said Effie, who was a fanciful little body, full of odd whims and notions, which her friends loved to gratify, regardless of time, trouble, or money; for she was the last of three little girls, and very dear to all the family. "Well, my darling, I will see what I can do to please you, and not say a word until all is ready. If I could only get a new idea to start with!" And mamma went on tying up her pretty bundles with a thoughtful face, while Effie strolled to the window to watch the rain that kept her in-doors and made her dismal. "Seems to me poor children have better times than rich ones. I can't go out, and there is a girl about my age splashing along, without any maid to fuss about rubbers and cloaks and umbrellas and colds. I wish I was a beggar-girl." "Would you like to be hungry, cold, and ragged, to beg all day, and sleep on an ash-heap at night?" asked mamma, wondering what would come next. "Cinderella did, and had a nice time in the end. This girl out here has a basket of scraps on her arm, and a big old shawl all round her, and doesn't seem to care a bit, though the water runs out of the toes of her boots. She goes paddling along, laughing at the rain, and eating a cold potato as if it tasted nicer than the chicken and ice-cream I had for dinner. Yes, I do think poor children are happier than rich ones." "So do I, sometimes. At the Orphan Asylum today I saw two dozen merry little souls who have no parents, no home, and no hope of Christmas beyond a stick of candy or a cake. I wish you had been there to see how happy they were, playing with the old toys some richer children had sent them." "You may give them all mine; I'm so tired of them I never want to see them again," said Effie, turning from the window to the pretty baby-house full of everything a child's heart could desire. "I will, and let you begin again with something you will not tire of, if I can only find it." And mamma knit her brows trying to discover some grand surprise for this child who didn't care for Christmas. Nothing more was said then; and wandering off to the library, Effie found "A Christmas Carol," and curling herself up in the sofa corner, read it all before tea. Some of it she did not understand; but she laughed and cried over many parts of the charming story, and felt better without knowing why. All the evening she thought of poor Tiny Tim, Mrs. Cratchit with the pudding, and the stout old gentleman who danced so gayly that "his legs twinkled in the air." Presently bedtime arrived. "Come, now, and toast your feet," said Effie's nurse, "while I do your pretty hair and tell stories." "I'll have a fairy tale to-night, a very interesting one," commanded Effie, as she put on her blue silk wrapper and little fur-lined slippers to sit before the fire and have her long curls brushed. So Nursey told her best tales; and when at last the child lay down under her lace curtains, her head was full of a curious jumble of Christmas elves, poor children, snow-storms, sugarplums, and surprises. So it is no wonder that she dreamed all night; and this was the dream, which she never quite forgot. She found herself sitting on a stone, in the middle of a great field, all alone. The snow was falling fast, a bitter wind whistled by, and night was coming on. She felt hungry, cold, and tired, and did not know where to go nor what to do. "I wanted to be a beggar-girl, and now I am one; but I don't like it, and wish somebody would come and take care of me. I don't know who I am, and I think I must be lost," thought Effie, with the curious interest one takes in one's self in dreams. But the more she thought about it, the more bewildered she felt. Faster fell the snow, colder blew the wind, darker grew the night; and poor Effie made up her mind that she was quite forgotten and left to freeze alone. The tears were chilled on her cheeks, her feet felt like icicles, and her heart died within her, so hungry, frightened, and forlorn was she. Laying her head on her knees, she gave herself up for lost, and sat there with the great flakes fast turning her to a little white mound, when suddenly the sound of music reached her, and starting up, she looked and listened with all her eyes and ears. Far away a dim light shone, and a voice was heard singing. She tried to run toward the welcome glimmer, but could not stir, and stood like a small statue of expectation while the light drew nearer, and the sweet words of the song grew clearer. A child's voice sang, a child's hand carried the little candle; and in the circle of soft light it shed, Effie saw a pretty child coming to her through the night and snow. A rosy, smiling creature, wrapped in white fur, with a wreath of green and scarlet holly on its shining hair, the magic candle in one hand, and the other outstretched as if to shower gifts and warmly press all other hands. Effie forgot to speak as this bright vision came nearer, leaving no trace of footsteps in the snow, only lighting the way with its little candle, and filling the air with the music of its song. "Dear child, you are lost, and I have come to find you," said the stranger, taking Effie's cold hands in his, with a smile like sunshine, while every holly berry glowed like a little fire. "Do you know me?" asked Effie, feeling no fear, but a great gladness, at his coming. "I know all children, and go to find them; for this is my holiday, and I gather them from all parts of the world to be merry with me once a year." "Are you an angel?" asked Effie, looking for the wings. "No; I am a Christmas spirit, and live with my mates in a pleasant place, getting ready for our holiday, when we are let out to roam about the world, helping make this a happy time for all who will let us in. Will you come and see how we work?" "I will go anywhere with you. Don't leave me again," cried Effie, gladly. "First I will make you comfortable. That is what we love to do. You are cold, and you shall be warm, hungry, and I will feed you; sorrowful, and I will make you gay." With a wave of his candle all three miracles were wrought,--for the snow- flakes turned to a white fur cloak and hood on Effie's head and shoulders, a bowl of hot soup came sailing to her lips, and vanished when she had eagerly drunk the last drop; and suddenly the dismal field changed to a new world so full of wonders that all her troubles were forgotten in a minute. Bells were ringing so merrily that it was hard to keep from dancing. Green garlands hung on the walls, and every tree was a Christmas tree full of toys, and blazing with candles that never went out. In one place many little spirits sewed like mad on warm clothes, turning off work faster than any sewing-machine ever invented, and great piles were made ready to be sent to poor people. Other busy creatures packed money into purses, and wrote checks which they sent flying away on the wind,--a lovely kind of snow-storm to fall into a world below full of poverty. Older and graver spirits were looking over piles of little books, in which the records of the past year were kept, telling how different people had spent it, and what sort of gifts they deserved. Some got peace, some disappointment, some remorse and sorrow, some great joy and hope. The rich had generous thoughts sent them; the poor, gratitude and contentment. Children had more love and duty to parents; and parents renewed patience, wisdom, and satisfaction for and in their children. No one was forgotten. "Please tell me what splendid place this is?" asked Effie, as soon as she could collect her wits after the first look at all these astonishing things. "This is the Christmas world; and here we work all the year round, never tired of getting ready for the happy day. See, these are the saints just setting off; for some have far to go, and the children must not be disappointed." As he spoke the spirit pointed to four gates, out of which four great sleighs were just driving, laden with toys, while a jolly old Santa Claus sat in the middle of each, drawing on his mittens and tucking up his wraps for a long cold drive. "Why, I thought there was only one Santa Claus, and even he was a humbug," cried Effie, astonished at the sight. "Never give up your faith in the sweet old stones, even after you come to see that they are only the pleasant shadow of a lovely truth." Just then the sleighs went off with a great jingling of bells and pattering of reindeer hoofs, while all the spirits gave a cheer that was heard in the lower world, where people said, "Hear the stars sing." "I never will say there isn't any Santa Claus again. Now, show me more." "You will like to see this place, I think, and may learn something here perhaps." The spirit smiled as he led the way to a little door, through which Effie peeped into a world of dolls. Baby-houses were in full blast, with dolls of all sorts going on like live people. Waxen ladies sat in their parlors elegantly dressed; black dolls cooked in the kitchens; nurses walked out with the bits of dollies; and the streets were full of tin soldiers marching, wooden horses prancing, express wagons rumbling, and little men hurrying to and fro. Shops were there, and tiny people buying legs of mutton, pounds of tea, mites of clothes, and everything dolls use or wear or want. But presently she saw that in some ways the dolls improved upon the manners and customs of human beings, and she watched eagerly to learn why they did these things. A fine Paris doll driving in her carriage took up a black worsted Dinah who was hobbling along with a basket of clean clothes, and carried her to her journey's end, as if it were the proper thing to do. Another interesting china lady took off her comfortable red cloak and put it round a poor wooden creature done up in a paper shift, and so badly painted that its face would have sent some babies into fits. "Seems to me I once knew a rich girl who didn't give her things to poor girls. I wish I could remember who she was, and tell her to be as kind as that china doll," said Effie, much touched at the sweet way the pretty creature wrapped up the poor fright, and then ran off in her little gray gown to buy a shiny fowl stuck on a wooden platter for her invalid mother's dinner. "We recall these things to people's minds by dreams. I think the girl you speak of won't forget this one." And the spirit smiled, as if he enjoyed some joke which she did not see. A little bell rang as she looked, and away scampered the children into the red-and-green school-house with the roof that lifted up, so one could see how nicely they sat at their desks with mites of books, or drew on the inch-square blackboards with crumbs of chalk. "They know their lessons very well, and are as still as mice. We make a great racket at our school, and get bad marks every day. I shall tell the girls they had better mind what they do, or their dolls will be better scholars than they are," said Effie, much impressed, as she peeped in and saw no rod in the hand of the little mistress, who looked up and shook her head at the intruder, as if begging her to go away before the order of the school was disturbed. Effie retired at once, but could not resist one look in at the window of a fine mansion, where the family were at dinner, the children behaved so well at table, and never grumbled a bit when their mamma said they could not have any more fruit. "Now, show me something else," she said, as they came again to the low door that led out of Doll-land. "You have seen how we prepare for Christmas; let me show you where we love best to send our good and happy gifts," answered the spirit, giving her his hand again. "I know. I've seen ever so many," began Effie, thinking of her own Christmases. "No, you have never seen what I will show you. Come away, and remember what you see to-night." Like a flash that bright world vanished, and Effie found herself in a part of the city she had never seen before. It was far away from the gayer places, where every store was brilliant with lights and full of pretty things, and every house wore a festival air, while people hurried to and fro with merry greetings. It was down among the dingy streets where the poor lived, and where there was no making ready for Christmas. Hungry women looked in at the shabby shops, longing to buy meat and bread, but empty pockets forbade. Tipsy men drank up their wages in the bar- rooms; and in many cold dark chambers little children huddled under the thin blankets, trying to forget their misery in sleep. No nice dinners filled the air with savory smells, no gay trees dropped toys and bonbons into eager hands, no little stockings hung in rows beside the chimney-piece ready to be filled, no happy sounds of music, gay voices, and dancing feet were heard; and there were no signs of Christmas anywhere. "Don't they have any in this place?" asked Effie, shivering, as she held fast the spirit's hand, following where he led her. "We come to bring it. Let me show you our best workers." And the spirit pointed to some sweet-faced men and women who came stealing into the poor houses, working such beautiful miracles that Effie could only stand and watch. Some slipped money into the empty pockets, and sent the happy mothers to buy all the comforts they needed; others led the drunken men out of temptation, and took them home to find safer pleasures there. Fires were kindled on cold hearths, tables spread as if by magic, and warm clothes wrapped round shivering limbs. Flowers suddenly bloomed in the chambers of the sick; old people found themselves remembered; sad hearts were consoled by a tender word, and wicked ones softened by the story of Him who forgave all sin. But the sweetest work was for the children; and Effie held her breath to watch these human fairies hang up and fill the little stockings without which a child's Christmas is not perfect, putting in things that once she would have thought very humble presents, but which now seemed beautiful and precious because these poor babies had nothing. "That is so beautiful! I wish I could make merry Christmases as these good people do, and be loved and thanked as they are," said Effie, softly, as she watched the busy men and women do their work and steal away without thinking of any reward but their own satisfaction. "You can if you will. I have shown you the way. Try it, and see how happy your own holiday will be hereafter." As he spoke, the spirit seemed to put his arms about her, and vanished with a kiss. "Oh, stay and show me more!" cried Effie, trying to hold him fast. "Darling, wake up, and tell me why you are smiling in your sleep," said a voice in her ear; and opening her eyes, there was mamma bending over her, and morning sunshine streaming into the room. "Are they all gone? Did you hear the bells? Wasn't it splendid?" she asked, rubbing her eyes, and looking about her for the pretty child who was so real and sweet. "You have been dreaming at a great rate,--talking in your sleep, laughing, and clapping your hands as if you were cheering some one. Tell me what was so splendid," said mamma, smoothing the tumbled hair and lifting up the sleepy head. Then, while she was being dressed, Effie told her dream, and Nursey thought it very wonderful; but mamma smiled to see how curiously things the child had thought, read, heard, and seen through the day were mixed up in her sleep. "The spirit said I could work lovely miracles if I tried; but I don't know how to begin, for I have no magic candle to make feasts appear, and light up groves of Christmas trees, as he did," said Effie, sorrowfully. "Yes, you have. We will do it! we will do it!" And clapping her hands, mamma suddenly began to dance all over the room as if she had lost her wits. "How? how? You must tell me, mamma," cried Effie, dancing after her, and ready to believe anything possible when she remembered the adventures of the past night. "I've got it! I've got it!--the new idea. A splendid one, if I can only carry it out!" And mamma waltzed the little girl round till her curls flew wildly in the air, while Nursey laughed as if she would die. "Tell me! tell me!" shrieked Effie. "No, no; it is a surprise,--a grand surprise for Christmas day!" sung mamma, evidently charmed with her happy thought. "Now, come to breakfast; for we must work like bees if we want to play spirits tomorrow. You and Nursey will go out shopping, and get heaps of things, while I arrange matters behind the scenes." "It won't be a surprise; for I know you are going to ask some poor children here, and have a tree or something. It won't be like my dream; for they had ever so many trees, and more children than we can find anywhere." "There will be no tree, no party, no dinner, in this house at all, and no presents for you. Won't that be a surprise?" And mamma laughed at Effie's bewildered face. "Do it. I shall like it, I think; and I won't ask any questions, so it will all burst upon me when the time comes," she said; and she ate her breakfast thoughtfully, for this really would be a new sort of Christmas. All that morning Effie trotted after Nursey in and out of shops, buying dozens of barking dogs, woolly lambs, and squeaking birds; tiny tea-sets, gay picture-books, mittens and hoods, dolls and candy. Parcel after parcel was sent home; but when Effie returned she saw no trace of them, though she peeped everywhere. Nursey chuckled, but wouldn't give a hint, and went out again in the afternoon with a long list of more things to buy; while Effie wandered forlornly about the house, missing the usual merry stir that went before the Christmas dinner and the evening fun. As for mamma, she was quite invisible all day, and came in at night so tired that she could only lie on the sofa to rest, smiling as if some very pleasant thought made her happy in spite of weariness. "Is the surprise going on all right?" asked Effie, anxiously; for it seemed an immense time to wait till another evening came. "Beautifully! better than I expected; for several of my good friends are helping, or I couldn't have done it as I wish. I know you will like it, dear, and long remember this new way of making Christmas merry." Mamma gave her a very tender kiss, and Effie went to bed. The next day was a very strange one; for when she woke there was no stocking to examine, no pile of gifts under her napkin, no one said "Merry Christmas!" to her, and the dinner was just as usual to her. Mamma vanished again, and Nursey kept wiping her eyes and saying: "The dear things! It's the prettiest idea I ever heard of. No one but your blessed ma could have done it." "Do stop, Nursey, or I shall go crazy because I don't know the secret!" cried Effie, more than once; and she kept her eye on the clock, for at seven in the evening the surprise was to come off. The longed-for hour arrived at last, and the child was too excited to ask questions when Nurse put on her cloak and hood, led her to the carriage, and they drove away, leaving their house the one dark and silent one in the row. "I feel like the girls in the fairy tales who are led off to strange places and see fine things," said Effie, in a whisper, as they jingled through the gay streets. "Ah, my deary, it is like a fairy tale, I do assure you, and you will see finer things than most children will tonight. Steady, now, and do just as I tell you, and don't say one word whatever you see," answered Nursey, quite quivering with excitement as she patted a large box in her lap, and nodded and laughed with twinkling eyes. They drove into a dark yard, and Effie was led through a back door to a little room, where Nurse coolly proceeded to take off not only her cloak and hood, but her dress and shoes also. Effie stared and bit her lips, but kept still until out of the box came a little white fur coat and boots, a wreath of holly leaves and berries, and a candle with a frill of gold paper round it. A long "Oh!" escaped her then; and when she was dressed and saw herself in the glass, she started back, exclaiming, "Why, Nursey, I look like the spirit in my dream!" "So you do; and that's the part you are to play, my pretty! Now whist, while I blind your eyes and put you in your place." "Shall I be afraid?" whispered Effie, full of wonder; for as they went out she heard the sound of many voices, the tramp of many feet, and, in spite of the bandage, was sure a great light shone upon her when she stopped. "You needn't be; I shall stand close by, and your ma will be there." After the handkerchief was tied about her eyes, Nurse led Effie up some steps, and placed her on a high platform, where something like leaves touched her head, and the soft snap of lamps seemed to fill the air. Music began as soon as Nurse clapped her hands, the voices outside sounded nearer, and the tramp was evidently coming up the stairs. "Now, my precious, look and see how you and your dear ma have made a merry Christmas for them that needed it!" Off went the bandage; and for a minute Effie really did think she was asleep again, for she actually stood in "a grove of Christmas trees," all gay and shining as in her vision. Twelve on a side, in two rows down the room, stood the little pines, each on its low table; and behind Effie a taller one rose to the roof, hung with wreaths of popcorn, apples, oranges, horns of candy, and cakes of all sorts, from sugary hearts to gingerbread Jumbos. On the smaller trees she saw many of her own discarded toys and those Nursey bought, as well as heaps that seemed to have rained down straight from that delightful Christmas country where she felt as if she was again. "How splendid! Who is it for? What is that noise? Where is mamma?" cried Effie, pale with pleasure and surprise, as she stood looking down the brilliant little street from her high place. "So my little girl wanted to be a Christmas spirit too, and make this a happy day for those who had not as many pleasures and comforts as she has. She likes surprises, and we planned this for you all. She shall play the good fairy, and give each of you something from this tree, after which every one will find her own name on a small tree, and can go to enjoy it in her own way. March by, my dears, and let us fill your hands." Nobody told them to do it, but all the hands were clapped heartily before a single child stirred; then one by one they came to look up wonderingly at the pretty giver of the feast as she leaned down to offer them great yellow oranges, red apples, bunches of grapes, bonbons, and cakes, till all were gone, and a double row of smiling faces turned toward her as the children filed back to their places in the orderly way they had been taught. Then each was led to her own tree by the good ladies who had helped mamma with all their hearts; and the happy hubbub that arose would have satisfied even Santa Claus himself,--shrieks of joy, dances of delight, laughter and tears (for some tender little things could not bear so much pleasure at once, and sobbed with mouths full of candy and hands full of toys). How they ran to show one another the new treasures! how they peeped and tasted, pulled and pinched, until the air was full of queer noises, the floor covered with papers, and the little trees left bare of all but candles! "I don't think heaven can be any gooder than this," sighed one small girl, as she looked about her in a blissful maze, holding her full apron with one hand, while she luxuriously carried sugar-plums to her mouth with the other. "Is that a truly angel up there?" asked another, fascinated by the little white figure with the wreath on its shining hair, who in some mysterious way had been the cause of all this merry-making. "I wish I dared to go and kiss her for this splendid party," said a lame child, leaning on her crutch, as she stood near the steps, wondering how it seemed to sit in a mother's lap, as Effie was doing, while she watched the happy scene before her. Effie heard her, and remembering Tiny Tim, ran down and put her arms about the pale child, kissing the wistful face, as she said sweetly, "You may; but mamma deserves the thanks. She did it all; I only dreamed about it." Lame Katy felt as if "a truly angel" was embracing her, and could only stammer out her thanks, while the other children ran to see the pretty spirit, and touch her soft dress, until she stood in a crowd of blue gowns laughing as they held up their gifts for her to see and admire. Mamma leaned down and whispered one word to the older girls; and suddenly they all took hands to dance round Effie, singing as they skipped. It was a pretty sight, and the ladies found it hard to break up the happy revel; but it was late for small people, and too much fun is a mistake. So the girls fell into line, and marched before Effie and mamma again, to say goodnight with such grateful little faces that the eyes of those who looked grew dim with tears. Mamma kissed every one; and many a hungry childish heart felt as if the touch of those tender lips was their best gift. Effie shook so many small hands that her own tingled; and when Katy came she pressed a small doll into Effie's hand, whispering, "You didn't have a single present, and we had lots. Do keep that; it's the prettiest thing I got." "I will," answered Effie, and held it fast until the last smiling face was gone, the surprise all over, and she safe in her own bed, too tired and happy for anything but sleep. "Mamma, it was a beautiful surprise, and I thank you so much! I don't see how you did it; but I like it best of all the Christmases I ever had, and mean to make one every year. I had my splendid big present, and here is the dear little one to keep for love of poor Katy; so even that part of my wish came true." And Effie fell asleep with a happy smile on her lips, her one humble gift still in her hand, and a new love for Christmas in her heart that never changed through a long life spent in doing good. A Christmas Dream, and How it Came to Be True is a featured selection in our collection of Children's Christmas Stories and Christmas Stories. You might also like Alcott's charming tale about boys seeking a hunting adventure, How They Ran Away. Add A Christmas Dream, and How It Came to Be True to your own personal library.